Lighting designer Peter Mumford is using Clay Paky’s powerful Sharpy luminaires to deliver ingenious lighting effects on Global Creatures’ ambitious multi-million dollar production of King Kong in Melbourne. With a scenic backdrop that primarily comprises video and lighting effects, Mumford has applied the bright, pure beams of 46 Sharpys in a unique way to create an almost architectural grid effects across the stage. He has also used the Sharpys to convey stunningly realistic gunfire effects as King Kong is shot down from the Empire State Building. 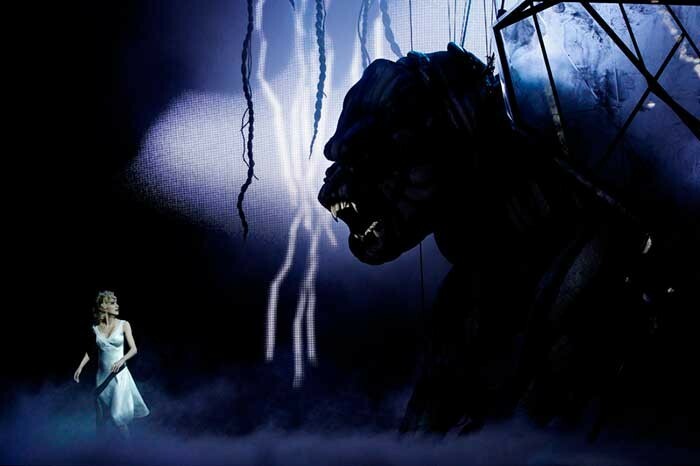 At the opening of the show the Sharpys are used to deliver a dynamic web of light, projected into a smoke curtain, which descends from the proscenium as King Kong makes his first entrance. "A lot of people are using Sharpys in a very similar way but for King Kong Peter Mumford has used them in a completely new way," says King Kong’s production electrician, Ken Roach. "His big mesh and tangled grid looks are unique and really exciting." Mumford explains: "I wanted to reflect the structure of the set in light and also create three dimensional structures of light that would work alongside the projection work of Frieder Weiss. The intense parallel beams that Sharpys are capable of were perfect for both these aspects of the production enabling me to ‘draw’ with them in the air. When used in this way they have a laser like quality but with more control. The movement is very fast and they are pretty accurate at maintaining precise positions and focus even when you’re hurling them around the stage at top speed. Within the overall structure of the lighting rig for King Kong they added a major scenic element built out of pure light." To achieve what is almost a scenic element of meshed light beams, the Sharpys are positioned on booms either side of the stage, rigged on their side on Tri truss. Sixteen Sharpys per side perform a very specific function throughout the show with their narrow beams not only creating grid effects across the stage but also simulating gunfire. Some of the most striking scenes, such as when Ann is offered as a sacrifice to Kong and also when Kong is shot down from the Empire State Building, rely on ingenious use of the Sharpys. "The Sharpys are extremely reliable fixtures," continues lighting crew chief on the show, Ben Meadows. "The grid effect is used in the opening number where programmer Victoria Brennan created a 3D grid using a red Styrofoam ball. We would hold the ball up at 1.5 metres, 3 metres, 4.5 metres and six metres and focus every Sharpy to each of those specific spots in the air. In the opening number every Sharpy on the booms is concentrated onto one spot stage left. It’s a really good effect, it looks amazing. We also have fourteen Sharpys recessed into the forestage with a grill above them, which are used to assist in making the lightweb as they punch through the grill." But Mumford’s imagination went further, and In a number of scenes, seven Art Deco inspired footlights flip up at the front of the stage to reveal Sharpys under four of them as Meadows elaborates: "Just four units create a really nice, soft and even footlight effect. Also because they are so compact in size they easily fit into what is a relatively small space downstage." For general lighting Mumford chose to use 39 Clay Paky Alpha Profile 700 fixtures, which supply the general back and side light for the show and the vehicles for gobo projection and aerial effects. All lighting was supplied by PRG. "With 240 moving lights in the rig, I have to try to make sure every unit can do as much as possible and is not restricted by space, set or masking," explains Mumford. "I like the Alpha Profiles very much. They are extremely versatile and dynamic in terms of the effects we can achieve." Emmanuel Ziino, managing director of Clay Paky’s Australian distributor, Show Technology, says: "Clay Paky has a strong well earned reputation for quality and innovation. Professionals are always happy to use Clay Paky products on any show knowing that performance will be guaranteed and reliability is a given." Show organisers say they expect more than 50,000 people to see King Kong, which is showing now at The Regent Theatre, Melbourne.